e3 Diagnostics offers the most advanced, state-of-the-art tympanometers on the market. Whatever your middle-ear testing needs are, rest assured that you will be able to effectively execute them with one of these stellar audiological instruments. Portable, lightweight, and compact, the Interacoustics Titan tympanometer lets you perform standard tympanometry, acoustic reflex, and reflex decay and latency tests on the go. With optional high-frequency probe tones (678, 800 and 1000 Hz), this portable tympanometer is designed to perform the most demanding diagnostic tests. 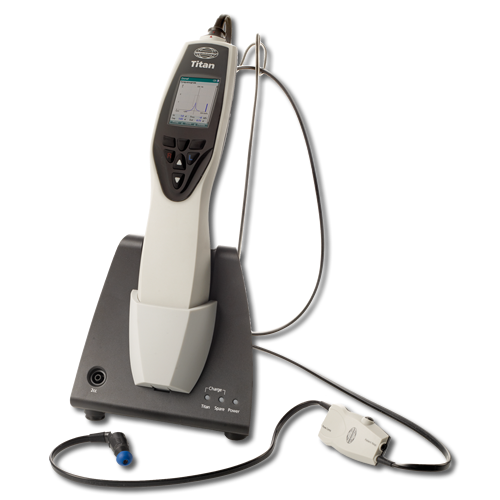 IMP440 delivers tympanometry through advanced technologies. These include: “Endless airflow” pressure control technology, high resolution recordings and an intelligent pump system with an adaptive speed control around the tympanic peak. The IMP44o module will help streamline and improve your daily workflow – in record speed. Electrically evoked stapedius reflex thresholds (eSRT) for objective measurement of the upper stimulus levels during the programming of a cochlear implant. Customize your Titan through dedicated software modules to create a winning combination for screening, diagnostic and advanced clinical testing.